Please note that international, oversize and multiple orders are subject to additional shipping cost. NEW! 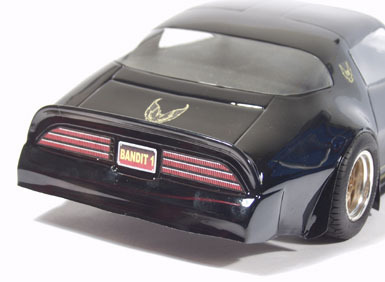 Smoke'N Bandit Body - Exclusively from R/C CAR Kings. This Classic muscle car body from the 1970s will fit most electric and nitro touring car chassis. It has very high detail and is pulled from.040" clear Lexan. The body comes as a 2 piece body with the nose being a separate part. Complete Smoke N' Bandit decal set. The separate nose piece allows for much greater detail. This is a Awesome 200mm body for multiple applications. Complete Smoke N' Bandit decal set. Part # RAE719 - for complete body. NEED SOME RIMS For the Smoke' N Bandit? HPI Work XSA 02 C - 6 mm wheels are officially licensed replicas from Work, manufacturer of some the lightest and strongest wheels available. Work wheels are extensively used by various motorsports teams in GT300, GT500, Formula 3, and the N1 endurance racing series. They are used on everything ranging from million dollar McLaren F1 race cars to Spoon Sports Honda Civics. Constant testing and motorsports feedback allows Work to develop super strong race proven wheels that are at home on the street or at the race track. 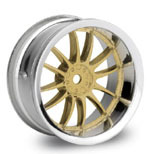 These wheels are available in 3mm, 6mm and 9mm offsets. 3mm offset gives a slightly wider stance to help fill out the wheelwells. Owners of 190mm electric cars can use our 6mm offset wheels if they want to use 200mm bodies. Throw on a pair of 9mm offset wheels for a super wide look. HPI Work XSA 3mm - wheels are officially licensed replicas from Work, manufacturer of some the lightest and strongest wheels available. Work wheels are extensively used by various motorsports teams in GT300, GT500, Formula 3, and the N1 endurance racing series. They are used on everything ranging from million dollar McLaren F1 race cars to Spoon Sports Honda Civics. Constant testing and motorsports feedback allows Work to develop super strong race proven wheels that are at home on the street or at the race track. HPI Work XSA 9mm - wheels are officially licensed replicas from Work, manufacturer of some the lightest and strongest wheels available. Work wheels are extensively used by various motorsports teams in GT300, GT500, Formula 3, and the N1 endurance racing series. They are used on everything ranging from million dollar McLaren F1 race cars to Spoon Sports Honda Civics. Constant testing and motorsports feedback allows Work to develop super strong race proven wheels that are at home on the street or at the race track. HPI 1979 Ford F-150 Supercab body for your Savage XL! This classic '79 Ford pick-up is the longer Supercab version so it fits the Savage XL truck perfectly. It will also fit Savage Flux trucks using the XL Wheelbase Conversion Set (#102404). And, it can be used on any standard Savage or Maxx-size truck, but will require alternate body post hole positions. HPI 1967 Pontiac GTO body. The '67 GTO is one of the most popular cars from the classic Muscle Car era of late '60's. Well deserving of the Muscle Car title, the '67 GTO came equipped with a range of potent engines that included a mighty 360bhp Ram Air V8 with more than enough power to haze the tires at stop lights and drag strips across America. Molded from thick 0.040" clear polycarbonate. The convenient pre-cut decal sheet includes: shiny chrome vinyl decals for the ultimate in realism, photo realistic headlights, grille, tail lights, official logos, window frames, door handles and more... all die-cut to make applying the decals quick and easy. Overspray film and pre-cut vinyl window masks are included with each body. A decal instruction sheet is included for decal placement, and the body has dimple marks for body post drill locations. This body will fit HPI Savage trucks and may fit other brands of monster trucks with modification. The Biggest Monster truck just got bigger.1/8 scale .050 Clear Lexan body with detailed decal sheet and window masks. The Subaru Impreza WRC 2004 body ships with two large flexible vinyl decal sheets for detailing the clear polycarbonate shell. Window lines, headlights, grilles, tail lights, HPI logos and several other details are on the decal sheet. A complete set of official Subaru WRC racing decals is included for scale realism! A convenient overspray film is included, as well as vinyl window masks to make painting quick and easy. To make mounting the body simple, an instruction sheet is included and the body has dimple marks for drill locations. The racing wing is modeled on the actual wing from the race car for high-performance good looks! Clear body with great detail. Pulled in Lexan with protective film. Fits 9.75 - 10.15 inch wheelbase - 8.19" inches wide at front wheels, 8.78 inches wide rear wheels. Comes with protective film and window masks! Comes with paint mask, decals and overspray film. 1/10th scale, 200mm wide CLEAR body, Pontiac Firebird Trans Am, driven in the 1970 Trans Am Series. Comes with paint mask and overspray film. McAllister #304– 1970 BOW TIE TRANS AM1/10, 200mm VTA Comes with paint mask and overspray film. Detail decals included. McAllister #307- MX-Stang GT- Road Race - This new body is intended for the USGT or open body Touring Car classes. Fits 190mm cars and includes detail decals for front and rear, as well as mask for windows and overspray film. 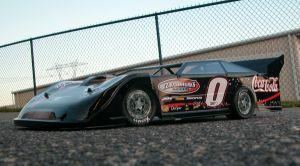 Great for Street Stock Oval racing on dirt or pavement. Fits Touring Cars with a 200mm off set, Pan Cars, or 200mm 4WD . Click on picture for larger image R.A.E. Top Fuel Body- Electric - This modern dragster clear body fits the Grand Motorsports, Walbern, Lockmann and many other dragster chassis.26.25" long. Comes with two injectors styles! R.A.E. Nitro Dragster Body - This dragster clear body fits the Grand Motorsports, Walbern, DSR and many other long-wheelbase nitro dragster chassis. 26.50" long, 3" wide at the cockpit, 1.5 at the ft. axle. Comes with long and short front winglets, too. R.A.E. Pro Body R05 - Pro Stock clear body with molded hood scoop and fine details. Body has narrow front at 5.2 inches and is 6.75 at rear wheels. 18.26 inches long and pulled in .030 Lexan. Fits 10.5 to 11 inch wheelbase chassis. Also includes protective film and window masks and decal sheet. R.A.E. Pro Mod Body R57 - Pro Mod clear body with molded hood scoop and extra fine details. Body has narrow front at 5.3 inches and is 6.75 at rear wheels. Fits 10.5 to 11 inch wheelbase chassis. Also includes protective film and window masks and decal sheet. R.A.E. Super Comp R34 clear body with molded hood scoop and extra fine details. Body has narrow front at 5.4 inches and is 7.25 at rear wheels. 17.5 inches long and pulled in .030 Lexan. Also includes separate rear wing. Fits 10.5 to 11 inch wheelbase chassis. Also includes protective film and window masks and decal sheet. R.A.E. Pro Mod R67clear body with molded hood scoop and extra fine details. Body has narrow front at 5.5 inches and is 7.35 at rear wheels. 19.5 inches long and pulled in .030 Lexan. Fits 10.5 to 11 inch wheelbase chassis. Also includes protective film and window masks and decal sheet. R.A.E. Super Gas R57R - Drag clear body with molded hood scoop and extra fine details. Body has narrow front at 5.3 inches and is 6.75 at rear wheels. 19.5 inches long and pulled in .030 Lexan. Fits 10.5 to 11 inch wheelbase chassisAlso includes protective film and decal sheet. R.A.E. Stude Pro Mod body - with molded hood scoop and extra fine details. Clear body has narrow front at 6.50 inches and is 7.40 at rear wheels. 19.80 inches long and pulled in Lexan. Fits 10.5 to 11 inch wheelbase chassis. Includes protective film, window masks and decals. R.A.E. Sylvester G. Pro Stock clear body was designed with molded hood scoop and fine details. Body has narrow front at 6.30 inches and is 6.80 inches at rear wheels. 18.10 inches long and pulled in Lexan. Fits 10.5 to 11 inch wheelbase chassis. Includes protective film, window masks and decals. RAE 04 Pro Stock Body- Body dimension are: 6.0 inches wide in the front to 6.75 in the rear, 18.25 inches long. Made from .030" lexan. Fits most 10.5 - 11 inch wheelbase drag chassis. This clear body also comes with a template to make your own rear spoiler (requires flat Lexan sheet). Also includes protective film, dcals and window masks. RAE 53 Pro Mod Body- This clear body comes with a separate rear spoiler that is molded to fit the rear contours of the trunk and fenders. The spoiler can be trimmed for a variety of applications. Body dimension are: 6.0 inches wide, 18.25 inches long. Made from .030" lexan. Fits most 10.5 - 11 inch wheelbase drag chassis. Also includes protective film, decals and window masks. 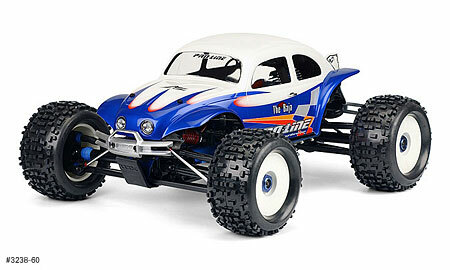 RAE 33 Coupe clear body  Molded-in bugcatcher and chute pack! Body dimension are: 5.75 inches wide in the front to 6.63 in the rear, 15.65 inches long. Made from .040" lexan. 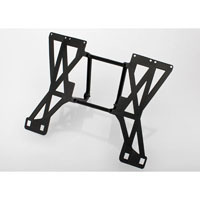 Fits most 10.5 to 11 inch wheelbase chassis. Also includes protective film, decals and window masks. RAE 05 Funny Car Body- This modern Fuel Coupe clear body comes with a separate rear spoiler. Body dimension are: 5.25 inches wide in the front to 6.25 in the rear, 20.125 inches long. Made from .030" lexan. Fits most 12 to 14 inch wheelbase funny car drag chassis. Also includes protective film and window masks. Click on picture for larger image RAE 09 Funny Car Body: This modern Fuel Funny Car body comes clear with a separate rear spoiler. Body dimension are: 5.6 inches wide in the front to 7.0 in the rear, 21.5 inches long. Made from .030" lexan. Fits most 12 to 14 inch wheelbase funny car drag chassis, wider than #610 so it will fit well on any Nitro Funny Car chassis. Also includes protective film, window masks and decal sheet. This clear body comes with a molded rear spoiler and separate side plates. Body dimension are: 5.6 inches wide in the front to 6.75" in the rear, 18.5 inches long. Made from Lexan. Fits most 11-11.5 inch wheelbase drag chassis. Also includes protective film, window masks and decal sheet. This clear body comes with a molded rear spoiler deck and great detail. Body dimension are: 4.75 inches wide in the front to 6.95" in the rear, 20.25 inches long. Made from Lexan. Fits most 11-11.5 inch wheelbase drag chassis. Also includes protective film and window masks and decal sheet. Part # RAE617-C Click on image for larger picture. This clear body comes with a molded rear spoiler deck and Pro Stock style scoop, and great detail. Body dimension are: 4.75 inches wide in the front to 6.95" in the rear, 20.25 inches long. Made from Lexan. Fits most 11-11.5 inch wheelbase drag chassis. Also includes protective film and window masks and decal sheet. Part # RAE617-S Click on image for larger picture. R.A.E. 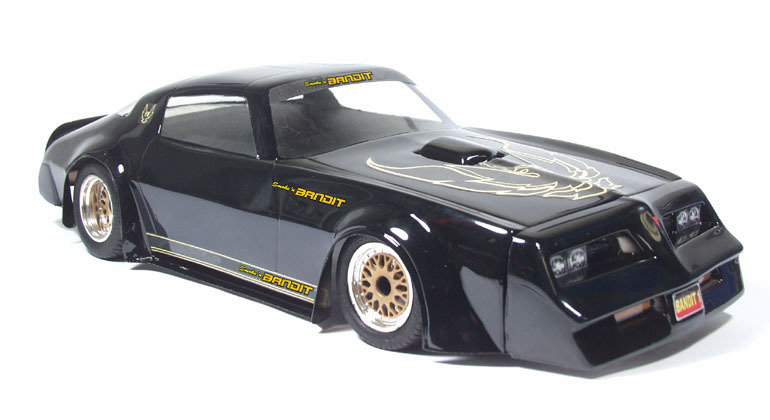 Classic Pro Mod C55 - Drag clear body comes with cool molded in blower and great detail. This body really works well in the air and has many E.T. and MPH records through the years. Pulled in Lexan with protective film and window masks. Fits 10.5 to 11 inch wheelbase chassis. R.A.E Classic Pro Mod C63 - Drag clear body with cool molded in hood scoop and great detail. Pulled in Lexan with protective film and window masks. Fits 10.5 to 11 inch wheelbase chassis. R.A.E. 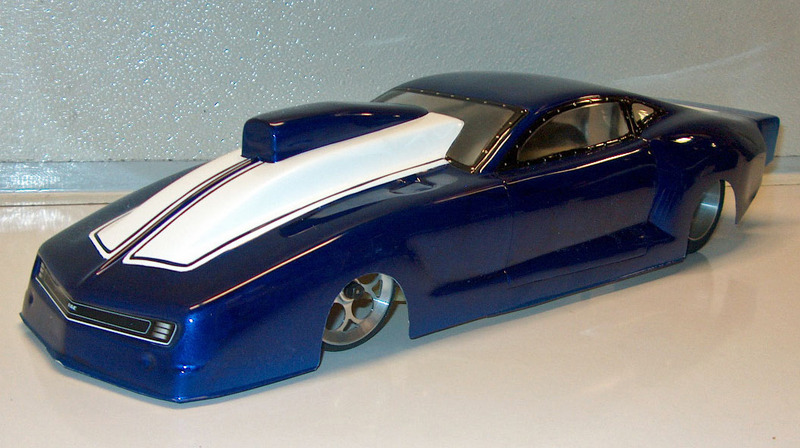 Classic Pro Mod C41 - Drag clear body with cool molded in blower and great detail. Pulled in Lexan with protective film and window masks. Fits 10.5 to 11 inch wheelbase chassis. R.A.E. Classic ProStock C96 - Pro Stock Drag NARROW clear body with cool molded in hood scoop and great detail. This body works well in the air. Pulled in Lexan with protective film and window masks. Fits 10.25 to 10.75 inch wheelbase chassis, and Bolink narrow drag chassis. R.A.E. Classic ProStock C97 - Pro Stock Drag NARROW clear body with cool molded in hood scoop and great detail. This body works well in the air. Pulled in Lexan with protective film and window masks. Fits 10.25 to 10.75 inch wheelbase chassis, and Bolink narrow drag chassis. R.A.E. Classic Funny Car C03 - Classic Funny Car clear body with cool molded in blower, separate rear wing and great detail. This body really works well in the air and has many records through the years. Pulled in Lexan with protective film and window masks. Fits 12.0 to 13.5 inch wheelbase chassis. Fits (Bolink, Lockmann, Grand Motorsports, Walbern, DragMaster). R.A.E Classic Funny Car C02 - Classic Funny Car clear body with cool molded in blower, separate rear wing and great detail. This body really works well in the air and has many records through the years. Fits 12.0 to 13.5 inch wheelbase chassis. (Bolink, Lockmann, Grand Motorsports, Walbern, DragMaster). Pulled in Lexan with protective film and window masks. R.A.E Classic Funny Car C01 - Classic Funny Car clear body with cool molded in blower, separate rear wing and great detail. This body really works well in the air and has many records through the years. Fits 12.0 to 13.5 inch wheelbase chassis. (Bolink, Lockmann, Grand Motorsports, Walbern, DragMaster). Pulled in Lexan with protective film and window masks. R.A.E. Classic Missile Dragster C1 - Classic Dragster clear body for 24 inch wheelbase with enclosed driver's compartment and detailed drag engine. Fits 24 inch wheelbase dragster chassis or can also be used for Nitro dragsters by trimming to fit. Pulled in Lexan with protective film and window masks. R.A.E. Classic Streamline Dragster C2 - Classic Dragster clear body for 24 inch wheelbase with driver's compartment, front wing and detailed drag engine. Fits 24 inch wheelbase dragster chassis or can also be used for Nitro dragsters by trimming to fit. Pulled in Lexan with protective film and window masks. R.A.E. Classic Pro Truck C99 - Classic NARROW Pro Truck clear body with cool molded in hood scoop and great detail. This body works well in the air. Pulled in Lexan with protective film and window masks. Fits 10.25 to 10.5 inch wheelbase narrow width chassis. R.A.E. Classic Pro stock C96W Body - WIDE - Drag clear body with cool molded in hood scoop and great detail. This body works well in the air. Pulled in Lexan with protective film and window masks. Fits 10.25 to 10.5 inch wheelbase chassis, and wide drag chassis and nitro, electric TOURING CAR Chassis. R.A.E. Classic Pro Stock C98 Body - Classic WIDE Pro stock clear body with cool molded in hood scoop and great detail. Pulled in Lexan with protective film and window masks. 7 inches wide in front, 7.5 inches wide at rear wheels - Fits 10.25 to 10.5 inch wheelbase wide chassis. (fits some Electric Touring chassis). Includes protective film, window masks. Narrow PRO STOCK/PRO MOD FRONT AXLE PLATE FOR ELEC. & NITRO. This plate will allow some drag specific bodies that have a narrow front track width to fit on RJ Speed Drag Chassis. Clear Body Without rear wing. This body is from the garages of the winningest team in NHRA history, 17-time champions John Force Racing! the Castrol GTX High Mileage car of John Force himself. Clear version without rear wing. Paint it the way you want it! Along with an aggressively wedge-shaped body and massive rear tires, a signature feature of an NHRA Funny Car is the huge rear wing that helps it harness 8,000 horsepower to achieve speeds over 300mph. The Traxxas Ford Mustang NHRA Funny Car follows suit with its accurately shaped and highly effective rear wing, made of rugged injection-molded plastic for durability, good looks, and authentic performance. Wing mount sold separately. 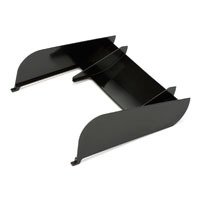 Traxxas 1/8 Scale Funny Car Body Rugged Rear Wing Mount. RJ Speed 11" W.B. 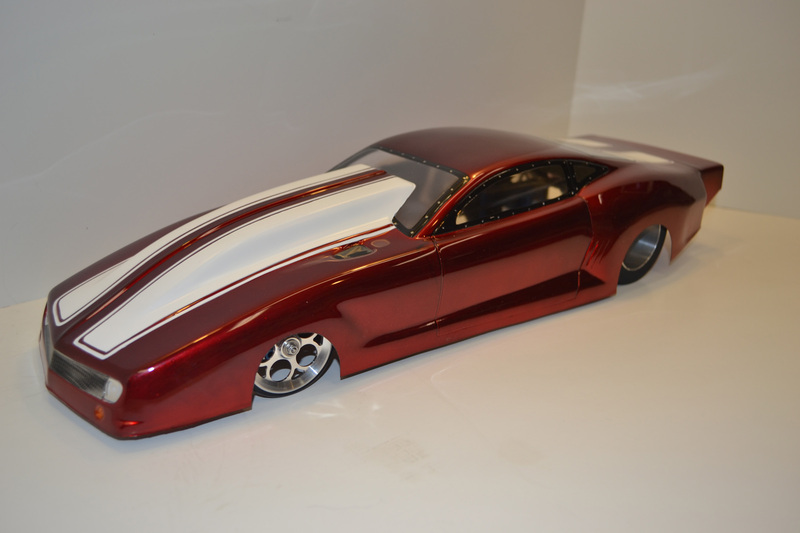 Pro Stock Drag Body - Description: Pro Stock Drag Race Body 11” wheelbase 1/10 scale. Comes clear with protective film and window masks. Fits 10 to 11 ½ “ wheelbase chassis. RJ Speed Funny Car Body 13” wheelbase w/wing - Description - Fits RJ SPEED, BoLink and other 1/10 chassis with 12 to 13 ½ “ wheelbase. Comes clear with protective film and window masks. Includes wing. RJ Speed Dragster Body for 30” W.B. 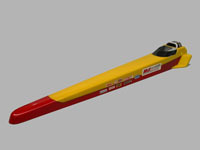 Nitro Rail - Description - DRAGSTER BODY FOR 30” W.B. NITRO RAILS. RJ Speed F41 Willys ProMod Body - Description - THIS PROMOD BODY FITS RJS PROSTOCK AND OTHER DRAG CHASSIS WITH 10.5" TO 12" WHEELBASE. THEY ARE MADE FROM CLEAR LEXAN AND HAVE PROTECTIVE FILM AND WINDOW MASKS. 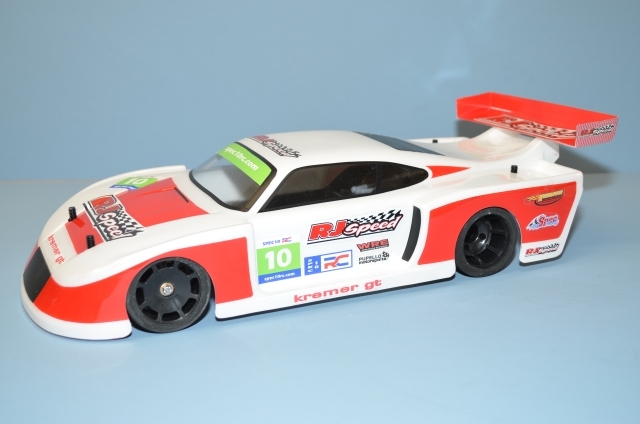 LENGTH 18.5 (470MM) WIDTH 7.5 (190) HEIGHT 4.5 (114) Note - Does not come with a rear wing! 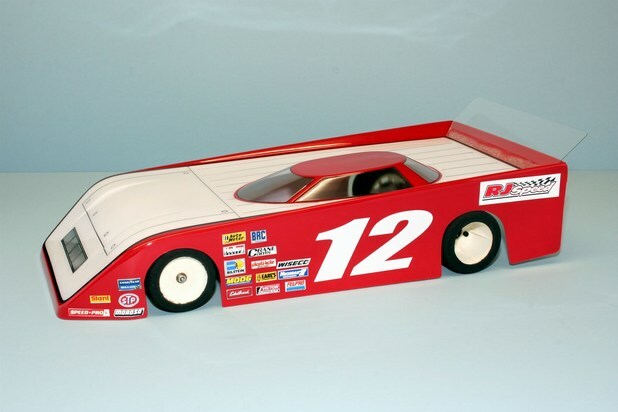 RJ Speed 1/10 Scale Oval Racing - 71 Cyclone Classic Stock Car Body. RJ Speed 1/12 Scale Digger Truck Body - Description: MADE FROM CLEAR LEXAN AND HAVE PROTECTIVE FILM AND WINDOW MASKS. LENGTH 12.2" - WIDTH 6.7" - Wheelbase 8.0"
Description: 1/10 scale clear lexan body with molded in rear spoiler includes precut window masks. TOUR legal! Specs: Length 17.8 "(453mm), Width 8.1 "(205mm), Height 3.7 "(95mm). 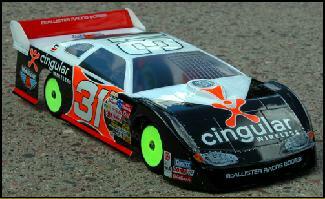 Description: 1/10 scale clear lexan body. includes precut window masks. Specs: Length 18" (457mm), Wheelbase 10.25" (260mm), Width 8.25" (209mm), Height 5"(127mm). 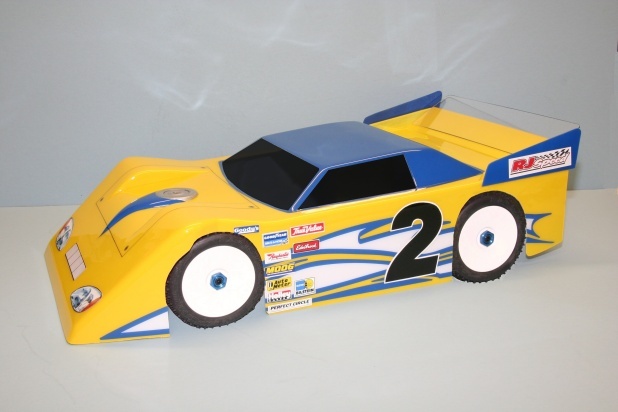 RJ Speed 1/10 Classic & Trucks 962 Style GTP 200mm Road Race Body - Description: MADE FROM CLEAR .040" LEXAN AND HAVE PROTECTIVE FILM AND WINDOW MASKS. LENGTH 17.0" - WIDTH 8.0 "F, 8.0"R - Wheelbase 10.5" - 11.5"
RJ Speed - CLASSIC MODIFIED COUPE BODY 1/10 Description: Comes clear and untrimmed with protective film. Fits RJ Speed 2014 Kit. 13 " (330mm) long x 4.7 "(119mm) wide x 3.5 "(89mm) high. 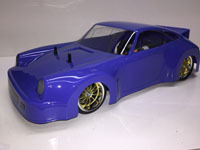 RJ Speed - CLASSIC MODIFIED SEDAN BODY 1/10 Description:Comes clear and untrimmed with protective film. Fits RJ Speed 2014 Kit. 14.00"(356mm) long x 4.6 "(117mm) wide x 3.5 "(89mm) high. Description: Classic sports car body made for RJSpeed Spec10 and other 200mm wide chassis. 18.5" (470mm) long, 8.1" (254 to 275mm) wide, 3.8" (96mm) high. Includes window masks and wing with mounting hardware. 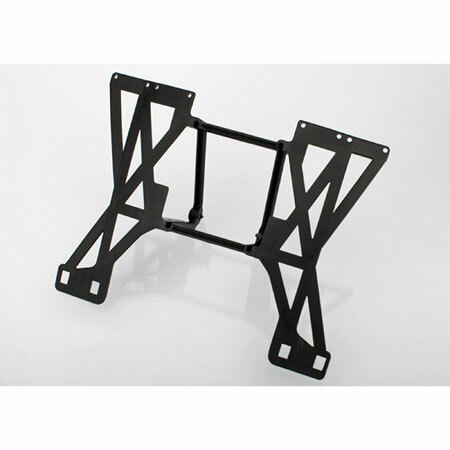 For 10" to 10.8" (254 to 275mm) wheelbase chassis. RJ Speed 1/12 Scale 40F Coupe Body - Description: MADE FROM CLEAR LEXAN AND HAVE PROTECTIVE FILM AND WINDOW MASKS. LENGTH 12.5" - WIDTH 6.75" - Wheelbase 7.8"
RJ Speed 1/12 Scale 55C 2Door Sedan Body - Description: MADE FROM CLEAR LEXAN AND HAVE PROTECTIVE FILM AND WINDOW MASKS. LENGTH 13.5" - WIDTH 6.75" - Wheelbase 7.7"
RJ Speed 1/12 Scale 65 GT Fastback Body - Description: MADE FROM CLEAR LEXAN AND HAVE PROTECTIVE FILM AND WINDOW MASKS. LENGTH 13.5" - WIDTH 6.75" - Wheelbase 7.75"
RJ Speed 1/12 Scale 67 SS Muscle Car Body - Description: MADE FROM CLEAR LEXAN AND HAVE PROTECTIVE FILM AND WINDOW MASKS. LENGTH 13.5" - WIDTH 6.75" - Wheelbase 7.7"
RJ Speed 1/12 Scale Digger Bug Body - Description: MADE FROM CLEAR LEXAN AND HAVE PROTECTIVE FILM AND WINDOW MASKS. LENGTH 12.2" - WIDTH 6.5"F, 7.2"R - Wheelbase 8.0"
RJ Speed 1/12 Scale Killer CV Body - Description: MADE FROM CLEAR LEXAN AND HAVE PROTECTIVE FILM AND WINDOW MASKS. LENGTH 13.6" - WIDTH 6.5" - Wheelbase 7.7"
RJ Speed 1/12 Scale 69 Charger Body - Description: MADE FROM CLEAR LEXAN AND HAVE PROTECTIVE FILM AND WINDOW MASKS. LENGTH 14.4" - WIDTH 6.8" - Wheelbase 8.0"
RJ Speed 1/12 Scale 1/12 ASA Cam - Description: MADE FROM CLEAR LEXAN AND HAVE PROTECTIVE FILM AND WINDOW MASKS. LENGTH " - WIDTH " - Wheelbase - "
RJ Speed 190 MM Wide 1/10 67 CV Hardtop Body - Description: MADE FROM CLEAR .030" LEXAN AND HAVE PROTECTIVE FILM AND WINDOW MASKS. LENGTH 16.6" - WIDTH 7.6" - Wheelbase 10.5" - 11.0"
RJ Speed 190 MM Wide 1/10 68 SS Muscle Body - Description: MADE FROM CLEAR .030" LEXAN AND HAVE PROTECTIVE FILM AND WINDOW MASKS. LENGTH 16.7" - WIDTH 7.6" - Wheelbase 10.0" - 10.5"
RJ Speed 190 MM Wide 1/10 65 GT Muscle Fastback Body - Description: MADE FROM CLEAR .030" LEXAN AND HAVE PROTECTIVE FILM AND WINDOW MASKS. LENGTH 16.7" - WIDTH 7.6" - Wheelbase 10.0" - 10.5"
RJ Speed 1/10 Classic & Trucks 68 SS Sedan Body - Description: MADE FROM CLEAR .040" LEXAN AND HAVE PROTECTIVE FILM AND WINDOW MASKS. LENGTH 17.7" - WIDTH 7.8"F, 8.2"R - Wheelbase 10.5" - 11.5"
RJ Speed 1/10 Classic & Trucks 46 Power Wagon Body - Description: MADE FROM CLEAR .050" LEXAN AND HAVE PROTECTIVE FILM AND WINDOW MASKS. LENGTH 16.0" - Width is 5.5" Inside Cab and 7.1" Full Width - Wheelbase 10.6" - 11.5"
RJ Speed 1/10 Classic & Trucks 55 C 2 Door Body - Description: MADE FROM CLEAR .050" LEXAN AND HAVE PROTECTIVE FILM AND WINDOW MASKS. LENGTH 16.3" - WIDTH 6.6" - Wheelbase 11.5"
RJ Speed 1/10 Classic & Trucks F Sport S Truck Body - Description: MADE FROM CLEAR .050" LEXAN AND HAVE PROTECTIVE FILM AND WINDOW MASKS. LENGTH 17.7" - WIDTH 6.6" - Wheelbase 11.0"
RJ Speed 1/10 Classic & Trucks 53 C Pickup Body - Description: MADE FROM CLEAR .050" LEXAN AND HAVE PROTECTIVE FILM AND WINDOW MASKS. LENGTH 16.8" - Width is 5.5" Inside Cab and 7.1" Full Width - Wheelbase 11.3"
RJ Speed 1/10 Classic & Trucks 56 F Pickup Body - Description: MADE FROM CLEAR .050" LEXAN AND HAVE PROTECTIVE FILM AND WINDOW MASKS. LENGTH 16.9" - Width is 6.0" Inside Cab and 7.5" Full Width - Wheelbase 11.5"
RJ Speed 1/10 Classic & Trucks Custom CA Pickup Body - Description: MADE FROM CLEAR .050" LEXAN AND HAVE PROTECTIVE FILM AND WINDOW MASKS. LENGTH 17.0" - WIDTH 6.75" - Wheelbase 11.0"
RJ Speed 1/10 Classic & Trucks 56 F Pickup Body - Description: MADE FROM CLEAR .040" LEXAN AND HAVE PROTECTIVE FILM AND WINDOW MASKS. LENGTH 17.0" - Width is 6.1" Inside Cab and 8.4" Full Width - Wheelbase 10.0" - 11.0"
RJ Speed 1/10 Classic & Trucks 41 C Pickup Body - Description: MADE FROM CLEAR .040" LEXAN AND HAVE PROTECTIVE FILM AND WINDOW MASKS. LENGTH 17.0" - Width is 6.2" Inside Cab and 8.4" Full Width - Wheelbase 10.5"
RJ Speed 1/10 Classic & Trucks 68 L-Cam Pickup Body - Description: MADE FROM CLEAR .040" LEXAN AND HAVE PROTECTIVE FILM AND WINDOW MASKS. LENGTH 18.0" - WIDTH 8.25" - Wheelbase 10.5"
RJ Speed 1/10 Classic & Trucks 67 CV Hardtop Body - Description: MADE FROM CLEAR .040" LEXAN AND HAVE PROTECTIVE FILM AND WINDOW MASKS. LENGTH 16.8" - WIDTH 8.0"F, 8.3"R - Wheelbase 10.5" - 11.0"
RJ Speed 1/10 Classic & Trucks 63 CV Coupe Body - Description: MADE FROM CLEAR .040" LEXAN AND HAVE PROTECTIVE FILM AND WINDOW MASKS. LENGTH 16.8" - WIDTH 8.1"F, 8.4"R - Wheelbase 10.0" - 10.5"
RJ Speed 1/10 Classic & Trucks 69 Charger Body - Description: MADE FROM CLEAR .040" LEXAN AND HAVE PROTECTIVE FILM AND WINDOW MASKS. LENGTH 18.5" - WIDTH 8.4"F, 8.6"R - Wheelbase 10.0" - 11.0"
RJ Speed 1/10 Classic & Trucks 68 SS Muscle Body - Description: MADE FROM CLEAR .040" LEXAN AND HAVE PROTECTIVE FILM AND WINDOW MASKS. LENGTH 17.7" - WIDTH 8.0"F, 8.2"R - Wheelbase 10.0" - 10.3"
RJ Speed 1/10 Classic & Trucks 65 GT Muscle Fastback Body - Description: MADE FROM CLEAR .040" LEXAN AND HAVE PROTECTIVE FILM AND WINDOW MASKS. LENGTH 17.6" - WIDTH 8.0"F, 8.2"R - Wheelbase 10.0" - 10.3"
RJ Speed 1/10 Classic & Trucks 64 C Sedan Body - Description: MADE FROM CLEAR .040" LEXAN AND HAVE PROTECTIVE FILM AND WINDOW MASKS. LENGTH 17.9" - WIDTH 8.5"F, 8.7"R - Wheelbase 10.0" - 11.0"
RJ Speed 1/10 Classic & Trucks 69 T Talladega Body - Description: MADE FROM CLEAR .040" LEXAN AND HAVE PROTECTIVE FILM AND WINDOW MASKS. LENGTH 18.0" - WIDTH 8.3"F, 8.7"R - Wheelbase 10.0" - 11.0"
RJ Speed 1/10 Classic & Trucks 49 F Pickup Body - Description: MADE FROM CLEAR .040" LEXAN AND HAVE PROTECTIVE FILM AND WINDOW MASKS. LENGTH 17.2" - Width is 6.1" Inside Cab and 8.4" Full Width - Wheelbase 10.0" - 11.0"
RJ Speed 1/10 Classic & Trucks 70 N VA SS Body - Description: MADE FROM CLEAR .040" LEXAN AND HAVE PROTECTIVE FILM AND WINDOW MASKS. LENGTH 17.9" - WIDTH 8.2 "F, 8.3"R - Wheelbase 10.0" - 11.0"
RJ Speed 1/10 Classic & Trucks 72 MC Stock Car Body - Description: MADE FROM CLEAR .040" LEXAN AND HAVE PROTECTIVE FILM AND WINDOW MASKS. LENGTH 17.8" - WIDTH 8.3"F, 8.6"R - Wheelbase 10.0" - 10.5"
RJ Speed 1/10 Classic & Trucks 70 S'Bird w/Wing Body - Description: MADE FROM CLEAR .040" LEXAN AND HAVE PROTECTIVE FILM AND WINDOW MASKS. LENGTH 18.8" - WIDTH 8.3"F, 8.7"R - Wheelbase 10.0" - 11.5"
RJ Speed 1/10 Classic & Trucks 33 Willys Coupe Body - Description: MADE FROM CLEAR .040" LEXAN AND HAVE PROTECTIVE FILM AND WINDOW MASKS. LENGTH 14.5" - WIDTH 6.6"F, 7.6"R - Wheelbase 10.5"
RJ Speed 1/10 Classic & Trucks Syclone Style Pickup Body - Description: MADE FROM CLEAR .040" LEXAN AND HAVE PROTECTIVE FILM AND WINDOW MASKS. LENGTH 16.5" - WIDTH 9.0"F, 9.0"R - Wheelbase - 10.5"
RJ Speed 1/10 Classic & Trucks Jammin Jimmy S-15 Style Body - Description: MADE FROM CLEAR .040" LEXAN AND HAVE PROTECTIVE FILM AND WINDOW MASKS. LENGTH 16.0" - WIDTH 9.0"F, 9.0"R - Wheelbase 10.0" - 10.5"
RJ Speed 1/10 Classic & Trucks 80's S Style Blazer Body - Description: MADE FROM CLEAR .040" LEXAN AND HAVE PROTECTIVE FILM AND WINDOW MASKS. LENGTH 16.0" - WIDTH 7.3 "F, 7.3 "R - Wheelbase 10.0" - 10.5"
RJ Speed 1/10 Classic & Trucks Deuce Coupe Body - Description: MADE FROM CLEAR .040" LEXAN AND HAVE PROTECTIVE FILM AND WINDOW MASKS. LENGTH 14.5" - WIDTH 4.0"F, 7.6"R - Wheelbase 10.0" - 10.5"
Description: MADE FROM CLEAR .040" LEXAN AND HAVE PROTECTIVE FILM AND WINDOW MASKS. LENGTH 16.8" - WIDTH 9.0"F, 9.0"R - Wheelbase 10.0" - 10.5"
RJ Speed 1/10 Classic & Trucks 55 Not Mad Wagon Body - Description: MADE FROM CLEAR .040" LEXAN AND HAVE PROTECTIVE FILM AND WINDOW MASKS. LENGTH 16.8" - WIDTH 8.3"F, 8.3"R - Wheelbase 10.0" - 10.3"
RJ Speed 1/10 Classic & Trucks 88 CV Wide- Body - Description: MADE FROM CLEAR .040" LEXAN AND HAVE PROTECTIVE FILM AND WINDOW MASKS. LENGTH 18.4" - WIDTH 8.9"F, 9.0"R - Wheelbase 10.0" - 10.5"
RJ Speed 1/10 Classic & Trucks 40 F Pickup Body Description: MADE FROM CLEAR .040" LEXAN AND HAVE PROTECTIVE FILM AND WINDOW MASKS. LENGTH 17.4" - Width is 6.1" Inside Cab and 8.4" Full Width - Wheelbase 10.0" - 10.5"
RJ Speed 1/10 Classic & Trucks 67 SS Muscle Car Wide- Body - Description: MADE FROM CLEAR .040" LEXAN AND HAVE PROTECTIVE FILM AND WINDOW MASKS. LENGTH 17.0" - WIDTH 9.0"F, 9.0"R - Wheelbase 10.0" - 10.5"
RJ Speed 1/10 Classic & Trucks 65 GT Muscle Car Wide - Body - Description: MADE FROM CLEAR .040" LEXAN AND HAVE PROTECTIVE FILM AND WINDOW MASKS. LENGTH 17.0" - WIDTH 9.0"F, 9.0"R - Wheelbase 10.0" - 10.5"
RJ Speed 1/10 Classic & Trucks 40 F Custom Coupe Body - Description: MADE FROM CLEAR .040" LEXAN AND HAVE PROTECTIVE FILM AND WINDOW MASKS. LENGTH 16.7" - WIDTH 8.0"F, 8.0"R - Wheelbase 10.0" - 10.5"
RJ Speed 1/10 Classic & Trucks 34 Sedan Hot Rod Body - Description: MADE FROM CLEAR .040" LEXAN AND HAVE PROTECTIVE FILM AND WINDOW MASKS. LENGTH 15.0" - WIDTH 8.0"F, 8.2"R - Wheelbase 10.0" - 10.2"
RJ Speed 1/10 Classic & Trucks 55 C 2 Door Sedan Body - Description: MADE FROM CLEAR .040" LEXAN AND HAVE PROTECTIVE FILM AND WINDOW MASKS. LENGTH 17.2" - WIDTH 8.4"F, 8.4"R - Wheelbase 10.0" - 10.2"
RJ Speed 1/10 Classic & Trucks 32 Coupe Street Rod Body - Description: MADE FROM CLEAR .040" LEXAN AND HAVE PROTECTIVE FILM AND WINDOW MASKS. LENGTH 14.0" - WIDTH 8.4"F, 8.4"R - Wheelbase 10.0"
RJ Speed 1/10 Classic & Trucks 80's S-10 Style Pickup Body - Description: MADE FROM CLEAR .040" LEXAN AND HAVE PROTECTIVE FILM AND WINDOW MASKS. LENGTH 16.0" - WIDTH 7.3 "F, 7.3 "R - Wheelbase 10.0" - 10.5"
McAllister Racing: #283– LERNERVILLE Late Model body 10” wide One piece with separate spoiler. Click on picture for larger image McAllister Racing: # 264 CAMARO STREET STOCK. Click on picture for larger image McAllister Racing: # 268 MONTE CARLO STREET STOCK. 7 3/4” wide front, 8” wide rear Detail Decals included with body. Click on picture for larger image McAllister Racing:’69 DODGE CHARGER STREET STOCK. 7 7/8” wide front — 8 ” wide rear. Detail Decals included. McAllister Racing: 1968 FAIRLANE 500 STREET STOCK BODY. McAllister Racing: #306– ‘OL SMOKEY STREET STOCK 66 Chevelle BODY. 9 1/2” wide. Detail Decals included. masks. Fits Custom Works and other 1/10 scale dirt oval cars. Description: Improved aerodyanamics for chassis with lower front shock towers. Clear .060 body with window masks and protective film. Lexan sheet for add-on rear spoiler/side dams included. Size: 24"(610mm) long x 12"(305mm) wide. RJ Speed : 1/18 Oval - Mini-Max wedge body for Losi 1/18 late model chassis. Description: Also fits 1/12 scale pan car chassis. Clear .030 lexan with window mask and protective film. Description: Clear .060 lexan with window mask and protective film. Size: 25 "(635mm) long x 12 "(304mm) wide x 6.0 "(152mm) tall.